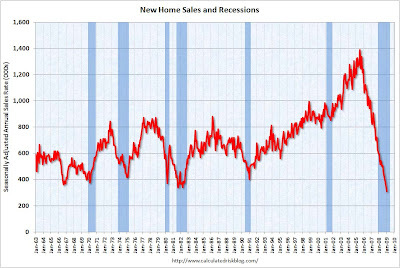 First, a look at the national scene to set the stage: New Home Sales Hit A Record Low. While prices have fallen precipitously in some bubble markets (e.g. Miami, Phoenix, Las Vegas, Los Angeles, San Diego) NYC has held up relatively well. However, we are merely behind the curve here; as I've posted before NYC is subject to the same factors behind those declines. Given the current sales drought, even a handful of auctions could reset prices for new condominiums citywide, said Jonathan J. Miller, the president of Miller Samuel, a Manhattan research and appraisal company. He said he expects the auctioned properties to sell for 40 to 45 percent below the asking prices of the first quarter of 2008, when the market peaked. There are 8,000 new condos on the market in New York City, and 22,000 more are scheduled to go on the market by the end of next year. I would expect to see some striking declines in apartment prices and to a lesser extent in rents over the next two quarters. Something to think about for policy makers, as this will not be a blip, but a reversion to historical valuations based on fundamentals (price/rent and price/income ratios). Graph taken from the Calculated Risk post linked above. Let it never be said that Sara from the Fresh Air Fund is not persistent! In all sincerity, the Fresh Air Fund is a great organization - please take a moment to check them out and make a contribution or volunteer to help low income city kids take in a bit of the countryside this summer. Just click on the image above top go to their website. The Empire State Transportation Alliance and campaign for new York's future rolled out a new ad campaign and website to support reliable, adequate funding for NYC's transit system. Take a minute to visit the website, Keep New York Moving, and tell your elected officials that NYC needs reliable transit, and we can't balance the budget on the backs of riders. Brownstoner makes a catch that Curbed missed yesterday: penthouse units at Northside Piers have been chopped 35-37%! Again: what does this bode for the Toll Bros. Gowanus project? It looks more and more likely that Toll will get its approvals for the site (outside of the overall rezoning of the Gowanus, where it should have been included) and either sit on or sell off it's newly acquired approvals. The approval process has been an absolute disgrace. This rezoning should never have been reviewed outside of the greater Gowanus rezoning. It's not too late for the City agencies to do the right thing and roll this parcel into the broader Gowanus rezoning, but given the current administration, I am not holding my breath. Per Curbed, Toll Bros. is slashing prices at its Northside Piers project in Williamsburg. They are currently building an entire second tower to add to that development. While the penthouses and most-expensive units at One Northside Piers were left unharmed, a large crop—over 30 units—are a bloody mess. A quick scan of StreetEasy to survey the wreckage shows reductions up to 25 percent in some cases, including this 11th-floor 3BR unit, marked down to $894,990 from an ask of over $1.2 million. Critical thinking exercise: what do you think this means for the Toll bros. Gowanus project? News flash: There is going to be a wave of foreclosures regardless. Over the past 8 years credit standards were abandoned, prices were inflated far beyond fundamentals, and speculators bought properties based on pie-in-the-sky pro forma financials. Before I went to law school I was a financial analyst and a lender for a large regional bank (until 2002). The decline in credit standards from 2002 - 2007 was nothing short of breathtaking. It was also the logical outgrowth of Bush administration policy: open the credit spigot, abandon regulatory practices and let the good times roll. This is the reason for the current economic crisis. It was always unsustainable, and while the adjustment back to valuations based on fundamentals (price/rent ratios, debt service/income ratios) will be painful for many, it is also unavoidable. Of course the big landlords are going to fight it tooth and nail. But don't rely on them to argue honestly. Improvements to Amtrak's inter-city rail system will also help every single commuter rail system in the region. Seven different commuter rail lines share the tracks and corridor that Amtrak uses. Last year, Amtrak carried 13 million people on the Northeast corridor between Boston and Washington DC. That's a lot of people. But the commuter rail systems carried more than 200 million passengers. That's even more people. In fact, it's 75 percent of all the commuter rail ridership in the nation. Second, making the Northeast corridor lines faster and more reliable would induce more people to choose rail over air for travel within the megaregion. This in turn would free up valuable space in our overcrowded Northeast airports, making landing slots available for more economically valuable, longer-haul flights. Passenger rail already accounts for nearly two-thirds of the combined air/rail market between New York and Washington and half of the market between New York and Boston. Bringing both of these shares to close to 100 percent, as is the case between many European city-pairs at this distance, would make a lot of sense. Right now, 20 percent of all the flights out of the New York metro airports are less than 350 miles, the majority of which are to two destinations, Boston and DC. More than 150 daily flights from the New York metro area are destined for Boston and Washington. Faster, more frequent and more reliable Amtrak service would make rail competitive with these short-haul flights, particularly for time-conscious business travelers. Third and finally, track improvements will not only increase speed, they will also add capacity. They will enable millions of additional people to travel along and within this corridor, which in turn, will enable the Northeast to absorb more gracefully the additional 16 million people expected here by mid-century. Improving the central train corridor of the Northeast is not only an economic development tool, not only a quality of life tool, it's a central part of a long-term growth plan for the region. And part of that growth plan should be a lower carbon footprint for the region, something better rail travel is an integral part of. The Democrat’s amendment to the bill would increase funding to $14.9 billion from $8.4 billion, including $2 billion for capital transportation needs, $2 billion for railways and $2.5 billion for new transit projects. The extra funding may mean hundreds of millions dollars more for New York City transportation, Schumer said. The region typically gets about a fifth or more of federal transportation spending, he said. I'd like to see more efforts like this from the rest of our delegation. Bear in mind, these funds are strictly for capital improvements . . . this will do nothing to plug the gap in the operating budget. For that we need our City and State elected officials to act. Mayor Bloomberg and City Council members: Act now to transfer the city-owned bridges to the MTA so that all river crossings can be tolled at parity. This would (1) raise vital reliable funds for transit, (2) reduce traffic congestion and (3) eliminate perverse incentives for motorists to avoid, e.g. the Battery Tunnel and create traffic bottlenecks at free crossings such as the Brooklyn Bridge. Governor Paterson, State Senators and Assembly Members: Bring back the commuter tax and dedicate these funds expressly for transit and retirement of transit-related debts, when possible. Enact legislation to allow NYC to institute a residential parking permit program, again with permit fees dedicated to transit. The MTA has plenty of faults, but the root cause of the current crisis was the failure of the State and City to adequately fund capital needs. Instead, MTA investments were paid for with debt, and that debt burden is now crushing the MTA. Thank you, George Pataki, Rudy Giuliani, and yes, Mike Bloomberg. We are at a crisis point; we need our politicians to step up and show some real leadership on this issue. Otherwise, as one less than venerable statesman put it in another context, this sucker's going down. 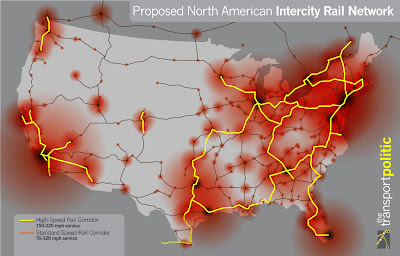 Via Streetsblog, there are some great new posts up at The Transport Politic for those who fantasize about an adequately funded, well designed high speed rail network in North America. Check out them out here and here. By national of course, we're really talking more about a series of connecting regional systems. The possibilities are really incredible if we make this a priority. A great way to reduce our reliance on imported oil, as well as free up capacity at airports for those flights that are not practical even with high speed rail (coast to coast, most international). More on this later. And while we're flogging Transport Politic's posts, Senator Schumer has expanded on Congressman Nadler's efforts to increase transit funding in the stimulus package. Still only crumbs, but gradually improving. New York magazine has a long and fascinating article on the genesis of one of the most regrettable real estate deals in history. I wish I could have seen my face when this deal was originally announced. I can remember shaking my head in shock at the price T-S paid. One must, however, tip their cap to the faceless MetLife exec who was on the other side of the table. MetLife sold at the absolute top of the market. This is a perfect example of asset prices inflated beyond all reason when credit lending standards were virtually abandoned over the last 8 years. According to people with knowledge of the deal’s structure, Tishman Speyer contributed $56 million of its own money to the $5.4 billion purchase price and didn’t use any of its other properties as collateral. “Jerry is a lover of nonrecourse debt and other people’s money. He liked deals where he could contribute sweat equity,” one real-estate investment banker says. “They have so little money in, and they make so much in management fees, they have nothing to lose when it goes under,” a former Tishman Speyer staffer said. The financing for the Stuy Town deal was facilitated by a fast-talking Wachovia banker named Rob Verrone. During the bubble years, Verrone became a symbol of the risk-taking that helped inflate the Manhattan market, and in real-estate circles he was dubbed “Large Loan Verrone.” From his table at San Pietro, Verrone held court and pitched Wachovia’s commercial-lending division to real-estate magnates like Donald Trump and Harry Macklowe. Verrone raised more than $4 billion for Stuy Town. Another $500 million came from Merrill Lynch. The game was really one of hot potato. Wachovia put $1 billion of the bank’s money into the Stuy Town deal, but the neat trick was that Wachovia sold the debt to investors. Hundreds of millions of dollars of Stuy Town’s equity is actually held by a Korean investment fund and CALPERS, the giant California retirement fund, among others. Wachovia also bundled Stuy Town’s $3 billion mortgage in a $7 billion bond offering. Another $1.4 billion tranche of financing, known as “mezzanine debt,” is held by investors including the real-estate firm SL Green and the government of Singapore. $56 million down with no recourse - that's nearly 100X leverage!! No wonder T-S bid so high, they offloaded nearly all the risk to fools. $56 million cap on the downside and unlimited upside if bubble economics continued for a few more years. Unbelievable.